What is the Google Pixel 2? The Google Pixel 3 has taken over from the Pixel 2 the as Google’s new flagship. Almost a year on from its original launch, the Pixel 2 has stood the test of time well and is still one of the best small-form-factor Android phones around. Despite being more expensive we’d still recommend it over Apple’s dinky iPhone SE, which finally got pushed off Apple’s website with the arrival of the new iPhone XS, iPhone XS Max and iPhone XR, all of which are, without question, large handsets. With long-term use, battery degradation is starting to rear its ugly head, but the Pixel 2’s performance and camera remain top notch and easily match newer phones such as the Galaxy S9, OnePlus 6 and even the aforementioned XS. However, with the Google Pixel 3 set to make its debut on October 9 and the company charging a reduced but still hefty £629 for the Pixel 2, its time in the sun is coming to a close. We’d recommend waiting to see what the Pixel 3 brings to the table as a result. If that’s not an option, read on for an in-depth look at how the Pixel 2 compares to this year’s flagships. The Pixel 2’s design was pretty old-fashioned when it first launched in October 2017. Midway through 2018, it sticks out like a sore thumb, especially when stood next to other flagships, like the Huawei P20 and iPhone XS. 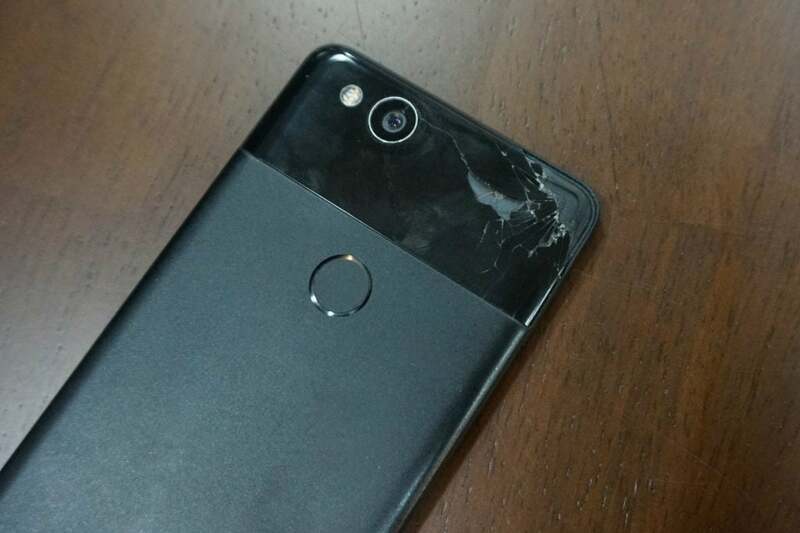 Instead of having a mixed metal and glass body, the Pixel 2 is mainly made from aluminium. The back has a stone-like finish. It’s harsh and textured; strange at first but, ultimately, nice to handle. It offers far more grip than shiny aluminium and isn’t as slippery when sat on a table the same way a glass back is. The only design flourish is the glass ‘visor’ that sits just above the metal main body, covering the camera sensor and flash. Aside from adding contrast to the metal, this is where all the cellular and WiFi antennas live. Giving them plenty of space should help connectivity, but it also means there are no antenna bands elsewhere. Over the last year the glass has proved surprisingly scratch-resistant but be warned, a single drop can turn it into a mosaic pattern of cracks. The below happened after a two-foot fall from a coffee table onto a wooden floor. The front also feels a little old-fashioned. Unlike the Pixel 2 XL or Samsung Galaxy S9, the Pixel 2 has a huge chin and forehead above and beneath its 5-inch display. The bezel here is more substantial than seen on the likes of the iPhone 8. Overall, the Pixel 2 isn’t much smaller than the Samsung Galaxy S9 or Huawei P20, but those sport much bigger 5.8-inch screens. It seems odd that Google has taken this design route, especially since more and more device makers are opting for a bezel-less look. At least Google has used that extra space on both ends of the phone to add dual front-facing stereo speakers – but it’s still hard to forgive. The Pixel 2 lags behind most flagships with IP67 (rather than some competitors’ IP68) dust and water resistance but the practical implications of a lesser IP rating are slight and having something is undoubtedly better than nothing. Another, less desirable trend that Google has decided to follow is the removal of the headphone jack. I can only assume that the decision was taken to help facilitate the phone’s water resistance but it’s a shame nonetheless. Even though you get a USB-C to 3.5mm adapter in the box and there are plenty of ‘Made for Google’ USB-C headphones out there, it’s still annoying. There isn’t a whole lot to get excited about with regards to the Pixel 2’s screen. As in the first iteration of the device, it’s a 5-inch, 1080p AMOLED panel that looks good but you couldn’t call it stunning. AMOLED panels are renowned for offering more saturated colours, perfect blacks and better contrast over their LCD counterparts, but Google likely opted for OLEDs on both Pixel 2s as it’s necessary for Daydream VR – which received a big push around the phone’s launch. I’m a huge fan of AMOLED displays but they’re not perfect. The panel on the Pixel 2 edges towards the warm side, so you’ll likely find that whites will have a slightly orange tinge. Note that Google doesn’t offer any option to adjust colours on the display, which is annoying if you prefer a slightly cooler screen. A great deal on the Pixel 2 XL with a nice and low monthly cost. You also get a gift card worth £25 for Amazon, Currys PC World or M&S included to sweeten the deal. Use our code TRUSTED10 to knock £10 off the upfront cost. Another good choice if you don’t need very much data each month from O2. Use code TRUSTED10 to save £10 on the upfront cost. Probably the single biggest feature lacking from the panels on both the Pixel 2 and Pixel 2 XL is support for high dynamic range or HDR. The ability to play back HDR10 and Dolby Vision content from the likes of Amazon and Netflix is available on the Galaxy Note 9, LG G7 and Apple’s iPhone XS – but it isn’t available on the Pixel 2. This is by no means a deal-breaker but it’s an odd feature to leave out when Google Play Movies and YouTube offer HDR support. 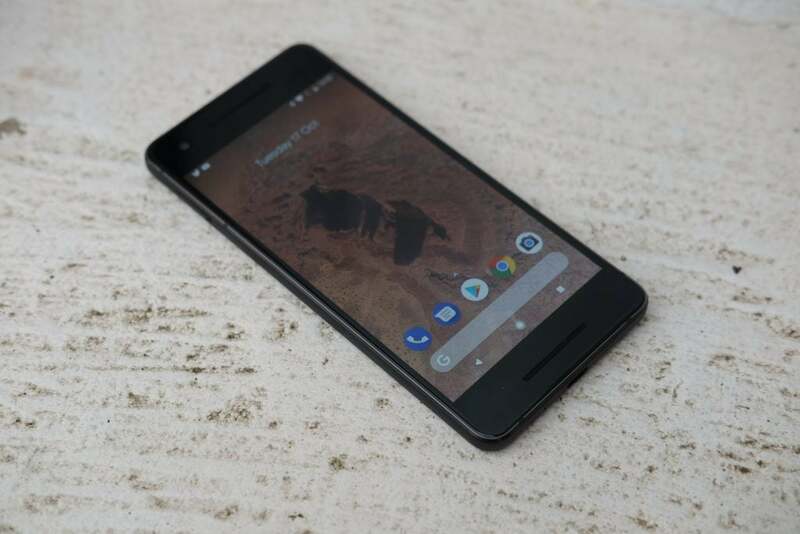 The post Google Pixel 2 appeared first on Trusted Reviews.